After looking at the calendar at http://www.whenisgood.net , this is what Basie 0.3 needs. Well something similar. The main features that we would like is the ease of just clicking times that you’re available and sending it out to other people to get a concensus on when would be most convenient to have a meeting or other group gatherings. If Basie were to pick this up, we would have to determine how the average user would like to use it or design it in such a way that they could use it however they like. The second option would seem more difficult and likely less design and user friendly. I like the simplicity of being able to just click on/off a time. I would like a click and drag kind of rectangle to select multiple squares at one time. This way if I have large chunks of time where I’m available, then I don’t have to select each square individually. In the options menu, I like being able to select dates to show. However, I do feel that option should be visible at all times and not hidden away. I also like being able to adjust the time range display during the day with a separate option to highlist a certain time range. After at least two users have inputted their availability time, the calendar has green squares and grey square with red dots in them. I think that’s a neat idea because the green squares indicate times when everyone can make it and if you click on a square with a red dot, it shows which users cannot make it at that time. (Thinking back now, this would have made deciding when to have basie IRC meetings much easier). I just took a look at doodle.com. In my opinion, it was OK. nothing really blew me away and although the process was pretty streamlined, it took way too many steps to complete the creation of an even and too many pages to load as well. For Basie, I think it’s most important to find out what users will actually be using this for. Would they use it primarily for scheduling a weekly meeting? or will their meetings be determined on a week to week basis? I like the Blackberry calendar application because it allows for re-occurrence of an event. So I can input something like a weekly class and have it re-occur every Monday and Wednesday until a specified end date. This is definitely a useful option when setting schedules. This will also help users plan meetings over the course of the term if the regularly scheduled meeting time is problematic for one or two weeks only. However, if Basie users are only going to use this tool once in the beginning of the term and then never need it again, something more like doodle.com might be sufficient. Just set up the ‘event’ once and everyone remember it. Personally, I’d prefer to have something more like a calendar over a single event organizer. – Display on a week to week basis with “->”,”<-” arrows to go from previous or next week respectively. – When viewing days or week, option to chunk time into hour or half hour intervals only. Any other thoughts? I’m going to try and have something sketched for this, but want some input first. I’ve been waiting for more comments on the previous posts before I made any more decision just to get some feedback. Got some good comments from Liz (many thanks again). How many different layers of privacy should there be? 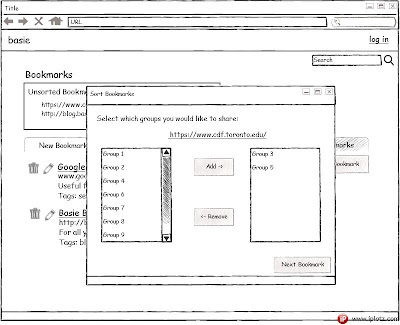 It makes sense to have personal bookmarks, group bookmarks, and public bookmarks. personal bookmarks are pretty straightforward, and the current sketch of the interface will support that just fine. The group bookmarks are somewhat trickier. I think that if a user selects that, a new selection box or check-boxes should appear of the groups/projects they belong to. Then they can select which project can see that bookmark. Otherwise the public bookmark will be seen by everyone. How public should public bookmarks be? could unauthenticated users view them? or should that be a separate level altogether? I think that all public bookmarks should be available to everyone, even unauthenticated users. However, they should not be allowed to comment or edit the bookmark. This is similar to a bulletin board where people can see posts, but not reply unless they’re logged in. 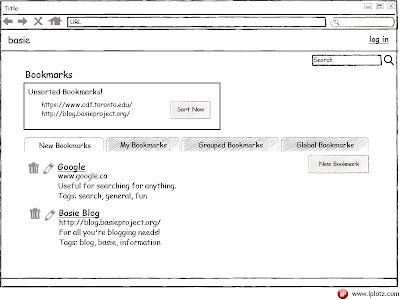 Speaking of comments, I will be adding more sketches of what the “Bookmarks” page should look like with comments. I think that if we are going the route of giving users updates upon log in, then any new bookmarks that they can view (but not necessarily edit) should also appear in that list. Also, authenticated users should be allowed to comment on any bookmark they can view and only the person who posted the bookmark should be allowed to change it (i.e. if the link was incorrect or note was wrong, then only the creator could go and change that). Again, unauthenticated users could view public bookmarks, but not comment or edit them. I’m also thinking of changing the “New Bookmark” button to just a text field where users can just type in a site url and hit enter. That would make it much easier to do, but then we get into privacy setting issues. Should the default be private for the user or public? I think in that case, the default should be private to the user, so that they can create bookmarks fairly quickly and if they decide to share it, then they can go through the extra steps to do so. 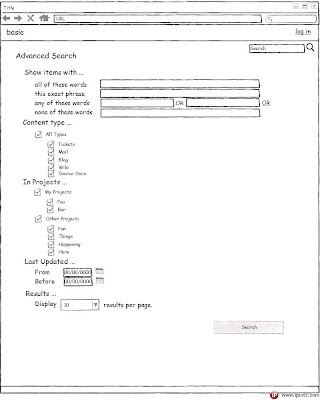 In that case, should the text field be inside or outside the tabs? If we put it inside the tabs, then the default would be context sensitive depending on where it is. if we put it outside, then the default would be private for the user. I think I need comments on that. There are so many options. Much sketch and show everyone! 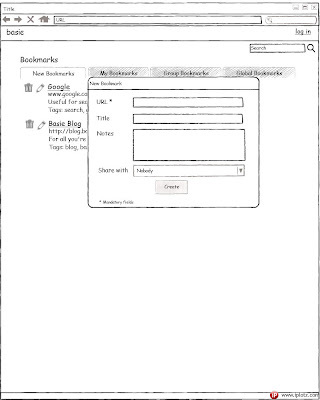 Those are two images I made about the social bookmarking feature for basie. I went with the tab feature because I thought that would be an easy way to navigate through the bookmarks especially if users have many different levels. 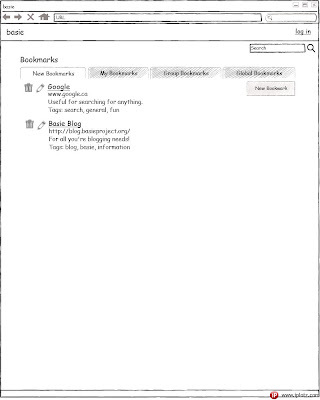 The “New Bookmarks” tab is like an update of new bookmarks that the user has permission to see. So either group bookmarks or global bookmarks. This may not be necessary, if we include newly created bookmarks as part of the events log or some other page where the suer can get updates. The “New Bookmark” button will be available in every tab and clicking on it, will cause a dialog box to appear with the appropriate fields to craete a new window. The default “Share with” option will depend on the context in which the “Create Bookmark” button was selected and in “New Bookmarks” I’m not sure what the default should be yet. Right now it says “Nobody” but I think that should be “Everybody”. The options will be “Nobody”, “Group”, “Everybody”. I haven’t worked out what to do if the user is part of several groups and wants specific bookmarks for each group. I’m also not sure what to do about editing bookmarks either. I think that users should only be able to edit bookmarks that they created, but allowed to comment of every bookmark. This is something I have not included in the above sketches. This is it for now. Thanks! Asked to design a simple bookmarking tool for Basie now. I’ve been looking around for some good examples, and these seem to be the best though I looked through several more. * Google – what doesn’t google have? Google’s bookmark saver is essentially the most basic one you can have. It only allows you to add, remove, and edit your own bookmarks. So it does not allow sharing and viewing other users’. This feature is tied in to browsing history. Some sites don’t take you directly to the site when you click on it. It will first take you to a more details view. I’m personally not a fan and I think that in the context of Basie, it would just be easier and more intuitive to make the link take you straight to the page that’s bookmarked. Simpy has a very simple, yet not very visually appealing, interface. I like the little [+] next to links and notes to add a new link or note. I’m not entirely sure what the purpose of notes are. Simpy also allows users to create a group, watch other users, and see who’s watching them. There is also a “similar users” field that, I’m going to assume, will display users who have similar links as you. Another feature of most bookmarking sites is the ability to set the privacy level of the bookmark. Most only offer public or private. For Basie, it would make sense to have public, group, and private (though private may not be used very much). One thing I was thinking about for this feature for Basie is the ability to easily share information among the class from the prof and from students. I am taking CSC318 which is an HCI course, and all the students are given access to all the other group projects. This would definitely make that easier to manage since at the moment, we’re using a wiki page that the TA’s and professor post the projects to. If every group could just bookmark a link to their document or web application, it would make it easier to get information. However, unless the course is designed in such a way where teams are able to see other teams’ work, then there would not be much use for this. I can envision it being used mostly by the professor posting useful links with the occasional student doing so as well. Then in that case, an announcement, blog post, wiki, forum post, or e-mail would be sufficient. This is it for now. I might edit this in the near future. I worked on this as well over the week in iPlotz. That is a VERY useful tool. I think my only problem with it would be the rendering time. It’s a little slow on the drag and drop and opening of windows. This could also be my laptop since I haven’t tried it on any other computers. Anyways, I think it looks much better than the terrible photoshop I did of the other one. It’s cleaner which is nice. I did also change the Last Updated section based on the option they had in iPlotz. Again, don’t forget to comment! Thanks! You are currently browsing the Nothing But Phyllers blog archives for March, 2009.